The intuitive way to manage table sections and layouts. The old way of scribbling on a laminated floor plan with a grease pen is messy and inefficient. It’s hard to estimate wait times and optimize table assignments without seeing key information like how long tables have been occupied. Most apps that try to use data to improve on the grease pen approach make the mistake of clinging to the old-fashioned floor map diagram, which is deceptively complex. Why? Searching the whole map for the information you need is slow. Comparing different clusters of shapes, colors, and symbols is complicated. And interpreting a bunch of unordered data, like little progress bars, spread across all the tables, is very difficult. To name a few reasons. All this extra complexity is unnecessary. Wait staff shouldn’t need a map to find tables after a couple days on the job. What they need is a fair, easy, intuitive way to know where to seat the next customer. Look how much simpler it is when you group tables into a framework where the data can work for you, and you can read key information naturally like a book, in ordered lines, from top to bottom and left to right. Tables are grouped by sections, and sorted by availability to make comparisons and decisions simple. The open tables for each section stand out in green on the left. Tables that have been occupied the longest show first, with the time displayed in the lower left. So it is easy to do a quick scan within a section to see how busy it is, as well as compare across sections. Tapping on a table will bring up an action bar for adding customers to tables, clearing tables when done, changing table statuses, and more. If you organize your tables and sections differently by day or time, Waitlist Me also gives you the flexibility to switch between different layouts. For example, you might divide tables into 6 sections for a busy weekend night, but only need 3 for a regular weekday night. By tapping on the Layouts link in the top right, you can choose from among your saved layouts and regroup your tables and sections on the fly. Split screen mode will let you manage your waitlist and assignments from the same screen on an iPad. With Waitlist Me’s table management features, your customers will get better service, with less waiting. Your employees will get their fair share of the work, and the tips. And you’ll have a more efficient restaurant, and a more profitable business. Stop struggling with floor maps. 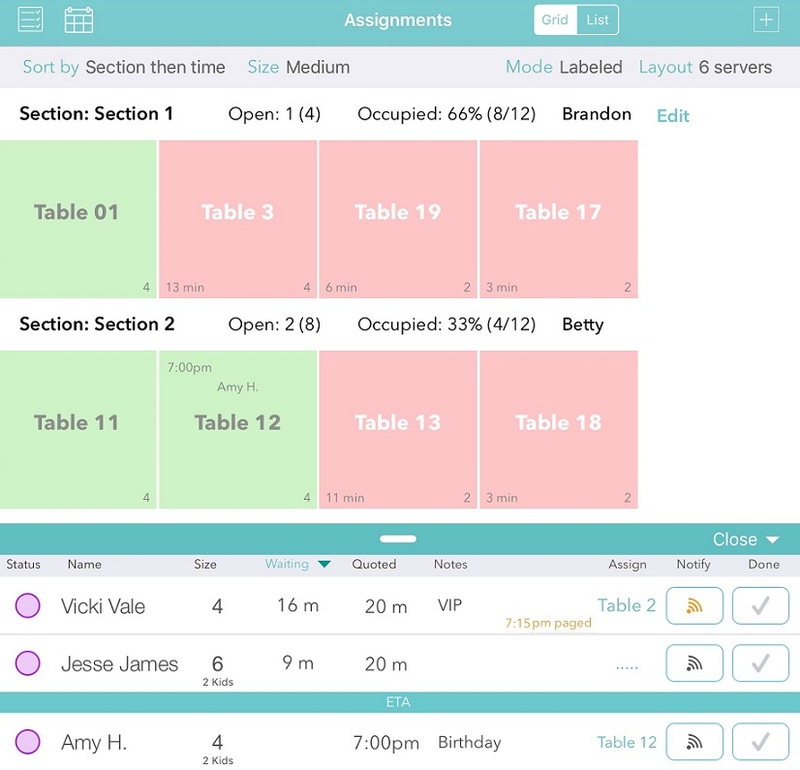 Take control of your tables, and your business, with Waitlist Me.